1. Sharks can (sort of) sense fear. 2. Pumpkin patches in California are dusty and meltingly hot, even in October. 3. I’m having dinner with my Uncle Bob tonight. 4. My Uncle Bob lives in Minnesota. 5. 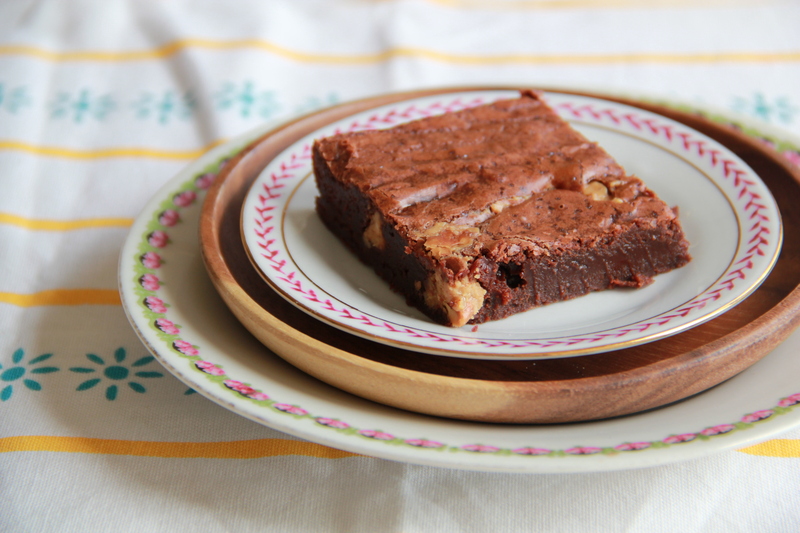 Brownies are sometimes best with peanut butter. I made these a few weeks ago, right after I got Dorie Greenspan’s baking bible which, incidentally, is called Baking. It’s a fantastic book, covering everything from scones and muffins to loaf cakes and cheesecakes and special occasion cakes, too. Hearty cookies to delicate French tarts. Crisps, crumbles, custards, puddings, ice creams. Also brownies. Dorie writes neatly and enticingly, and her recipes are notoriously flawless. Especially, I find, when they involve a bit of peanut butter. This is my take on Dorie’s Classic Brownie recipe. These are thin and almost dainty, but definitely fall into the fudgey (not cakey) brownie category. Dorie’s version is full of walnuts, but I took a slight non-tree-nut turn in that department, and decided to fill mine with chunky peanut butter instead. 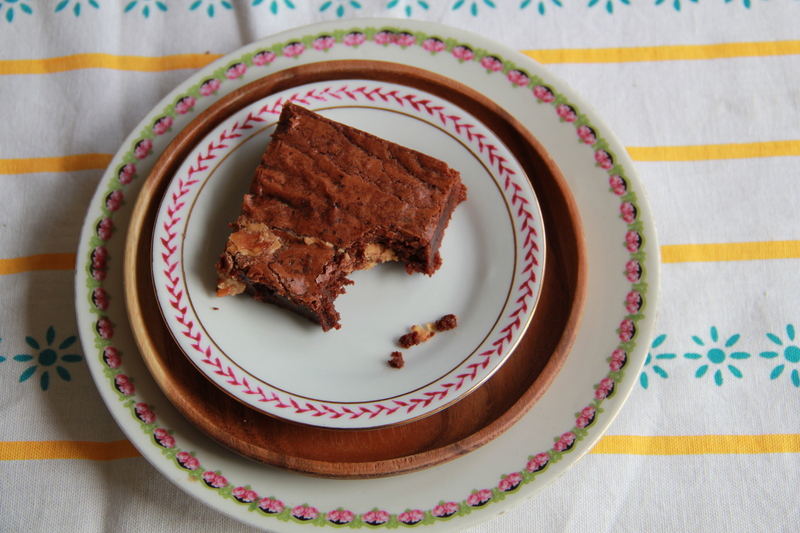 Because, you know, peanut butter brownies. Heat the oven to 325 degrees F. Grease and line an 8-inch square baking pan with parchment paper. Gently melt the chocolate together with the butter, either in a medium saucepan or the microwave (in a large bowl), and stir to combine. Next, whisk in the sugar (don’t worry if it looks grainy, it will all come together eventually). Whisk in the eggs, one at a time, then the vanilla, until completely smooth. Add the espresso powder, salt and flour, and stir just until incorporated. Scrape the batter into the pan and smooth the top with a spatula. Dollop the peanut butter by the tablespoonful on top of the brownie batter, and use a knife to gently swirl and spread it around. Bake the brownies for about 30 minutes, until the top is dull and a skewer inserted into the center comes out mostly clean. 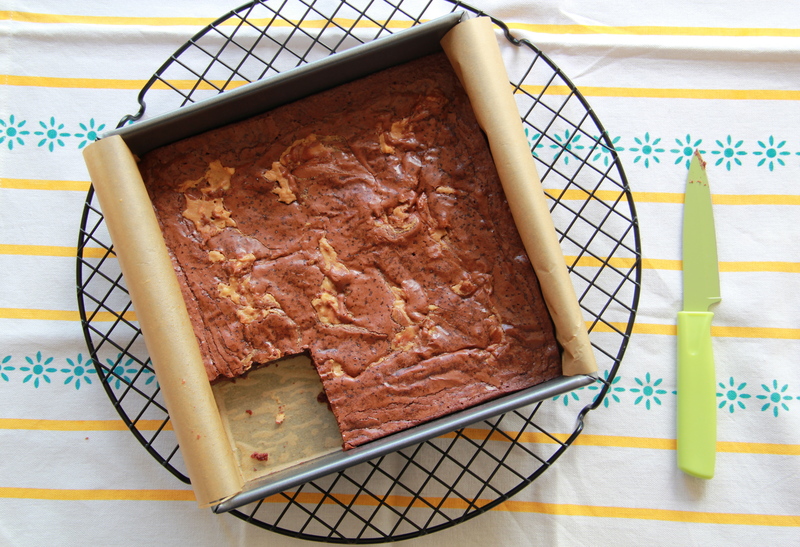 Transfer to a rack and allow the brownies to cool before slicing into squares with a sharp knife. These keep for about 2-3 days well-wrapped at room temperature. Makes 9-16 brownies, depending on how you slice them. Where were these on Sunday? ?